2017 has been one of the most challenging years for storm chasing and photography I have ever experienced to date. Thunderstorms were less frequent than previous years and those which did form were mostly high based or elevated grey cells which were unphotogenic. However, despite this complaint there was always something to chase and the adventures themselves from these bust warm days have made for fond memories and great friendships. Two thunderstorm days mid Summer made up for the former with a massive gust front over Coagh which was my best personal chase in years followed by a photogenic day of multicell thunderstorms in perfect light from Gortmore viewing point. 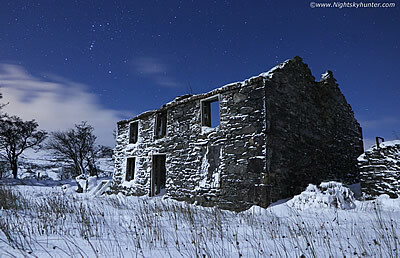 2017 boasted several severe wind events, blowing snow, blowing sand, beautiful aurora and NLC displays and a selection of night sky photo shoots, the highlights of these were the Causeway cliff top moonlit aurora show and the sublime moonlit snow shoot from Glenshane Pass near the end of the year. Two extreme events did happen when the August 22nd severe thunderstorm event produced prolific lightning and an incredible once in a life time flood event which washed away cars and bridges which placed this storm in the epic category, and let's not forget the extreme hype of Ex-Hurricane Ophelia which brought severe winds and country wide work closures leaving ghost towns in it's wake. These adventures and more are documented through these 15 image reports complimented by ground based video, time lapse cinematography and drone footage, thanks very much for viewing. First image report of 2017 documenting three night shoots along the Co. Antrim coast shooting nightscapes, star trails and the a beautiful evening conjunction between Venus, Mars and the crescent Moon. A combination of solo and joint photography with John Fagan, Glen Miles and Nigel McFarland. 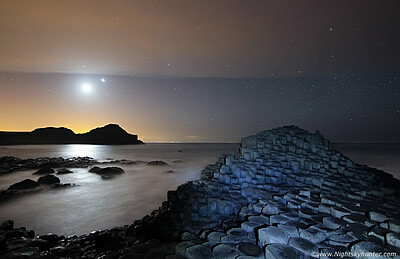 The highlight was a breathtaking moonlit star trail shoot from the high cliff tops above the Giant's Causeway which ranks as the most dangerous night landscape location I have shot from to date, the report ends with a nice moonless night at Ballintoy with star trails around the famous church. One page report with 14 images and 2 time lapse videos. - REPORT. New report detailing two days and nights on the north coast storm chasing and aurora hunting on March 20th and 21st 2017 with John Fagan and Glen Miles. 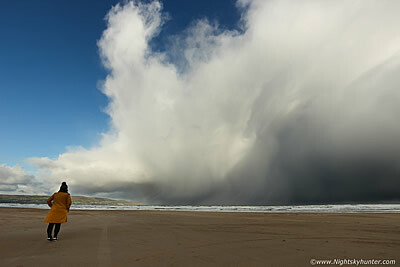 The first shoot documented daytime hail showers from Portstewart followed by an after dark storm watch on Downhill beach in the midst of clouds, wind, sleet and snow showers, the highlight was an nocturnal back sheared anvil with mammatus followed by a severe snow squall which produced blizzard conditions on the beach. Night two was a glorious clear moonless night when a 600km/sec solar wind stream and CIR region generated a beautiful aurora display with several outbursts captured from the Giant's Causeway and Ballintoy Church making this the best aurora in almost a year of sky watching. One page report with 12 images & 1 time lapse video. - REPORT. On April 24th 2017 an unstable Arctic air mass advected over N. Ireland bringing with it a nocturnal threat of hail and snow showers with a risk of thunderstorms along coastal areas. 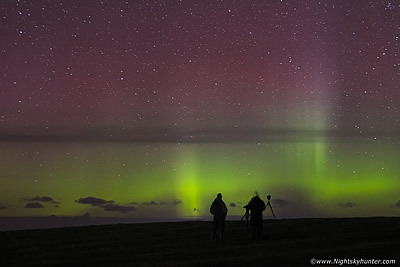 I teamed up with John Fagan and Nigel McFarland on Benone beach where we spent hours watching the skies. The convection refused to spark however the real action was happening all around us. 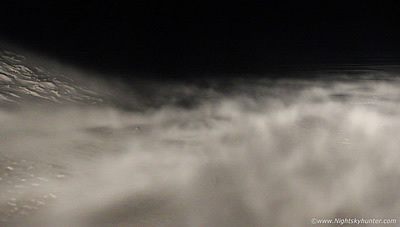 50mph Nly winds with convective gusts produced an impressive sustained display of blowing sand which looked like a desert dust storm which was extremely dramatic to watch. The report documents this aspect of the chase with video footage and stills to compliment the written account. Quite an exciting night of wind driven weather lasting until 02.30. One page report with 9 images and 2 video clips. - REPORT. On May 7th 2017 My Wife, Mother and I decided to head to the north coast for what looked to be yet another stunning sunny day with clear skies. Upon arrival on the NW coast we were shocked to find ourselves in a world of low fog, dark skies, poor visibility and cold temps with no ocean in sight. A NEly breeze had formed a sea fog temperature inversion which blew inland covering local coastal regions. 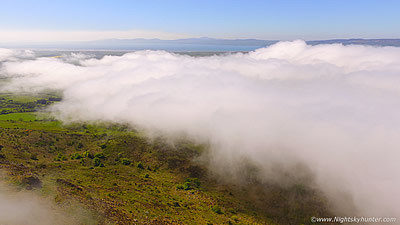 We decided to drive to the top of Binevenagh mountain where we emerged on top in a clearance and had a spectacular experience looking down on the white fog blanket covering the valleys and Lough Foyle. The view was beautiful and almost heavenly. One page report with 11 images & 1 video clip. - REPORT. Report detailing six days of storm chasing between May and June 2017 featuring a selection of local chases along Glenshane Pass and Benbradagh mountain where I spotted two funnel clouds followed by the biggest set-up of the year with 2000 CAPE which resulted in a long drive to Mullaghmore in Co. Sligo. 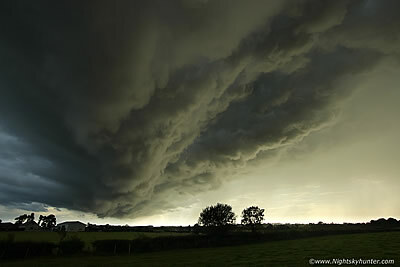 The account then gathers pace with several marginal events which produced a storm cell with strong outflow winds and time lapsed convection at Lough Foyle then climaxing with my third funnel cloud catch of the season outside Cookstown from Tuyllhogue Ring Fort followed by a rotating storm base over the town itself, all from low CAPE but slack convergence zone set-ups. One page report with 16 images and 4 video clips. - REPORT. An unexpected set-up on June 27th 2017 produced the best surface based storms of the year so far in N. Ireland. 400 CAPE with DLS, low LCLs and convergence all combined to generated a number of discrete intense thunderstorms. Cells fired in S. N. Ireland and moved N into the midlands and W at a slow pace with back building updraughts. I chased to Lough Neagh at Battery Harbour where I intercepted a massive cell crossing the lough overhead which dropped torrential rainfall with tail end charlie cell sporting a huge updraught with swirling rotation. One hour later by complete chance I encountered this same cell again near Castledawson roundabout, this time with rotating updraught complete with striation bands and sheared precip which looked very similar to an LP mesocyclone making this my first structure day of 2017. One report with 10 images. - REPORT. New report documenting two nights of NLCs on June 30th and July 2nd 2017 and a beautiful golden hour sunset across Lough Foyle from Magilligan Point. The June 30th NLC display is the main focus of this report when Paul Martin, John Fagan and I teamed up on a beautiful clear night and got treated to a stunning all-night long type 4.5 NLC display which we captured from a country road near Lough Beg then over Toomebridge. 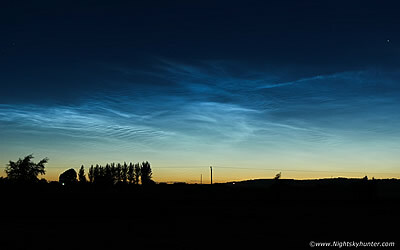 The NLCs boasted beautiful herringbone, band, and whirl structure which could be seen moving in real time with the naked eye illuminated in electric blue contrasting against the twilight sky above a bed of yellow horizon haze making this the best NLC display we have witnessed in the last two years. One page report with 11 images and 1 time lapse video. - REPORT. Detailed report documenting two chase days on July 30th and 31st 2017 with my Wife Roisin. Day 1 was a pulse storm day when we intercepted mean looking convective cells at Benone beach bringing heavy downpours and time lapse opportunities. 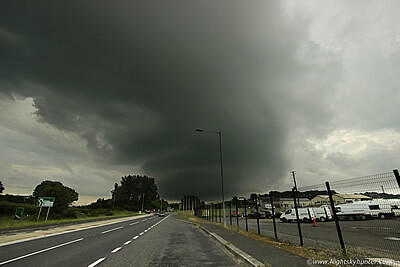 Day 2 was the climax of the season when we got under the core of a midday storm over Glenshane Road which produced the best mammatus display I have seen in years. By late evening a new organized storm moved into Co. Tyrone with 40 knots of deep layer shear which we chased all through the back roads from Cookstown to Coagh then to the shore of Lough Neagh, this chase produced the best storm structure I have witnessed in two years with a massive solid gust front lit by the low evening sun passing over the fields and a farm house while rumbling with thunder offering us a perfect photogenic treat. One page report with 22 images and 1 video clip. - REPORT. August 1st 2017 looked like a good day for chasing with moderate CAPE overlapped by decent wind shear. Cloud killed inland convection during prime heating time so I decided on a chase to the N coast where blue skies and hot sunshine might trigger convection. 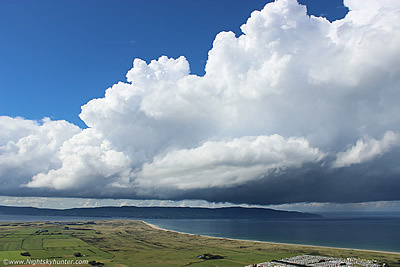 During the late afternoon sea breeze convergence generated a beautiful multicell thunderstorm which built over Co. Donegal before moving out to open sea. 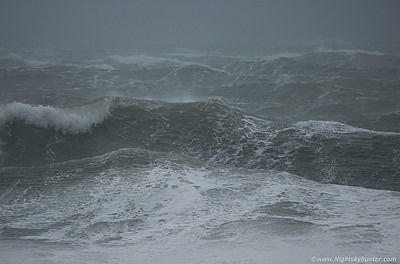 The sheared updraughts on this storm were huge and catching full sunshine while being surrounded by blue skies. 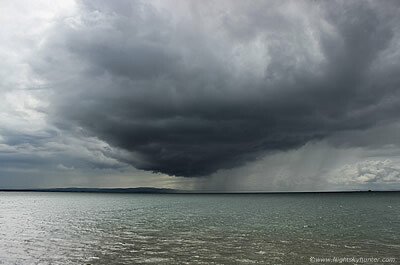 This cell sported explosive updraught development and even formed a shallow wall cloud over the sea while producing distant rumbles of thunder making for a very photogenic day. The sight of this storm from Gortmore Viewing Point against a backdrop of Lough Foyle, Donegal, Benone Beach and Magilligan Point was simply stunning. One page report with 16 images and 1 video clip. - REPORT. On August 22nd 2017 warm moist unstable air clashed with an inbound cold front in an environment of strong vertical wind shear which generated numerous elevated thunderstorms of a back building nature which dumped monsoon style rainfall over N. Ireland during daylight and night time hours accompanied by vigorous lightning activity. Parts of Derry, Donegal, Mid-Ulster, Tyrone and Antrim experienced a months rainfall within a few hours resulting in the worst thunderstorm flooding event in living memory with untold damage. 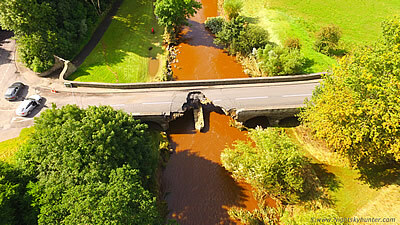 This report details a visit to two sites in Claudy the following day where a severe flood wiped out a bridge and road documented by both ground based and drone imagery. One page report with 13 images and 3 video clips. - REPORT. September 21st 2017 presented a rare clear night and a welcome change to indulge in night sky photography so a shoot was arranged. I met up with Nigel McFarland and together we shot several star trails around the Manannan Mac Lir statue at Gortmore Viewing Point on Binevenagh mountain. 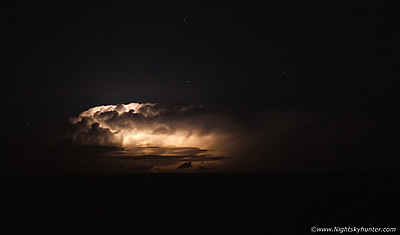 During the course of this shoot several flashes of lightning got our attention and soon we were watching a lively multicell thunderstorm at 70 miles range over the ocean illuminating its structure with lightning flashes with anvil and even an overshooting top visible with stars surrounding the cell. While all this was going on a faint aurora manifested on camera producing subtle green rays while the storm lit up in the same frame which made for an unexpected surprise and highly rewarding night. One page report with 11 images. - REPORT. October 16th 2017 was a date in which I met the most unusual and hyped storm of my life when Extra Tropical Storm or Ex-Hurricane Ophelia impacted Ireland. Met Eireann had issued an extremely rare countrywide red alert for widespread severe gales with hurricane force winds, phenomenal seas and even storm surges. Schools all over the country where shut for two days, many shops closed at midday and public warned to avoid travel and coastal areas. The S and SE of the country would be worst hit with 3 fatalities and a storm surge with 100,000 homes without power. My Wife and I targeted the SE coast of N. Ireland in Co. Down at St. John's where we experienced severe wind gusts and a sea in a state of fast moving churning chaos, this report documents this day. One page report with 6 images and 1 video clip. - REPORT. New image report documenting two night sky shoots on November 5th & 7th 2017. The first on the shore of Lough Neagh when I shot two moonlit star trails around the locally famous 'Cabin Tree' near Doss, a rare 400-600 year old ash tree of great form used as a visual aid for fishermen on the Lough. Night two was a shoot on the Causeway cliffs at the north coast where we were treated to the best aurora in years when a CIR CH event dipped to Bz -20 generating a stunning aurora which dominated the sky. The aurora boasted a three tier arc, multiple high altitude oval forms, and was so intense it washed out bright naked eye stars completely. 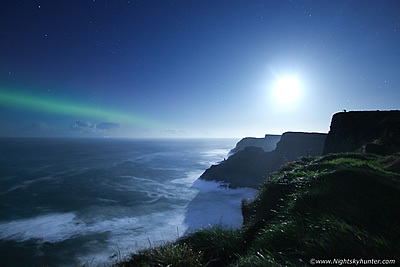 This was followed by a thrilling cliff top shoot with moonlit waves complimented by a vibrant green aurora arc. One page report with 20 images and 1 time lapse video. - REPORT. December 27th was my final storm chase of 2017 when after a relaxing Christmas my Wife and I decided to chase to the north coast to intercept cells forming on an unstable post frontal air mass, the trip was also mainly an excuse for a day of fresh air and exercise. Not expecting much we were surprised to be greeted by a stunning winter multicell cb dominating the ocean horizon, this cell exhibited impressive structure sporting dramatic curtains of cascading hail and wet snow falling over the sea making for some of the finest convective scenes of the year. The day ended with more cells at sunset which I documented via DSLR and by drone making for the perfect end to the year. One page report with 12 images and 1 video clip. - REPORT. This presentation features a compilation of video footage, DSLR time lapse and drone footage all captured during 2017. Subjects include thunderstorms, convection, shower squalls, snow scenes, waves, severe wind, Aurora Borealis, Noctilucent Clouds and much more. 2017 was the most challenging year I have ever experienced for weather action to date due to very few thunderstorms that were photogenic in nature, however several days during mid summer made up for this with great local chases. I was extremely busy chasing, shooting and filming various aspect of the sky and nature and gave it my all. This video is an attempt to showcase these chases and memories. Presentation is 21 min's in duration and best viewed at 1080p.